The Eagles made a surprise move on Thursday, adding 3-4 outside linebacker Connor Barwin. The initial reports of the deal were of an imposing six-year, $36 million contract. But only the first two years are guaranteed ($8 million), and the three-year total is just $13.5 million. That's quite a reasonable deal for a young pass rusher, although it muddles the overall defensive picture. Let's talk it out. First, there's Barwin himself. The 26-year-old former Houston Texan was drafted in the second round in 2009. 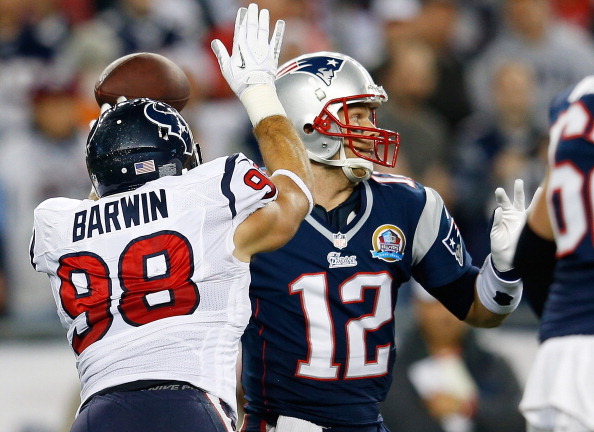 In his first season (as a 4-3 defensive end), Barwin registered 4.5 sacks in a backup role. After an injury in the 2010 opener caused him to miss the entire season, he returned as a starting OLB in Wade Philips' 3-4 defense the next year, notching 11.5 sacks. Last year, while he played 94 percent of the team's defensive snaps, Barwin regressed to only 3 sacks. It's tough to know exactly what that means. 19 sacks in your first three real seasons is impressive, although Barwin would be making a lot more money if his 2011 results had come last year. Pro Football Focus' pressure per play numbers were never that high on Barwin, even during 2011, and they declined further in 2012. Howie Roseman excused that performance, saying Barwin had fewer opportunities last year to play on the "open side" of the formation away from the tight end. He did rush the passer 86 percent of the time. Overall I think the move is fine. The more detailed contract numbers suggest that Barwin is being paid like an above average but not great pass rusher. At only 26, he still has upside, and he's the first guy the Eagles added with extensive experience as a 3-4 edge rusher. Plus, his 6'4", 260 lb. frame fits Chip Kelly's new physical mandate. Tough to argue with any of that. The bigger question is how the Barwin signing dominoes through the rest of the lineup. The Eagles have three incumbent players who seem likely to be slotted at outside linebacker: Trent Cole, Brandon Graham, and Vinny Curry. Without much data on Curry, he was going to be fighting for playing time regardless. Graham came on strong last year, with 5.5 sacks and a ridiculous 17.3 PRP from Pro Football Focus. It's unclear if he can make the transition to the 3-4, but he does seem to have a bright future ahead of him. Cole had a down year, though, and he's entering his age 31 season. His ability to convert to a new defense is even more suspect. If Cole's contract wasn't so onerous he would have been traded by now. Another complicating layer is that we don't know what the defense is really going to look like. If they go with the Billy Davis hybrid, all of the above players seem more like Predators than SAMs; they're primarily pass rushers who rarely drop back into coverage. Of course, having too many good pass rushers is rarely a problem, and Kelly is always preaching about catering the scheme to the players on hand. Final note: I doubt that the Barwin signing prevents the team from drafting another OLB early. To reiterate, there are questions with all of the current players, and the newcomer's deal is smaller than first thought. There are no guarantees going forward. Cary Williams & Kenny Phillips continue the trend of youth and high risk-reward signings that makes sense for a rebuilding team. A player like Philips, for example, has proven to be a good safety. A small bet on his health is a smart move, and it's even better in the secondary, where the team needs a complete overhaul. Sheil has good notes on Geno Smith's workout with the Birds. Interesting to hear what kind of drills Kelly ran him through. Tagged with Philadelphia Eagles, NFL, Connor Barwin, Linebacker, Billy Davis, Defense, Hybrid, 3-4, Trent Cole, Brandon Graham, Vinny Curry, Cary Williams, Kenny Philips, Geno Smith, Pro Football Focus, Pass Rush. March 15, 2013 by Brian Solomon.